What other industries permit agency pricing? In what other sector do you find manufacturers setting the prices and retailers having to, essentially, like it or lump it at a certain percentage? That’s Laura Dawson in the The Juicy Details, one of several blog posts she managed to knit into the unraveling scarf of publishing Wednesday. Dawson answered her own question at what my Google Reader says was 4:49 p.m.: Two other industries know agency pricing — Apple products are withheld from retailers who discount them, she writes, and the price of milk in New York and New Jersey is controlled by a dairy board. I’m particularly glad to have inkle studios’ advance artwork for the Ether from Dave Morris’ forthcoming Frankenstein app from Profile Books. 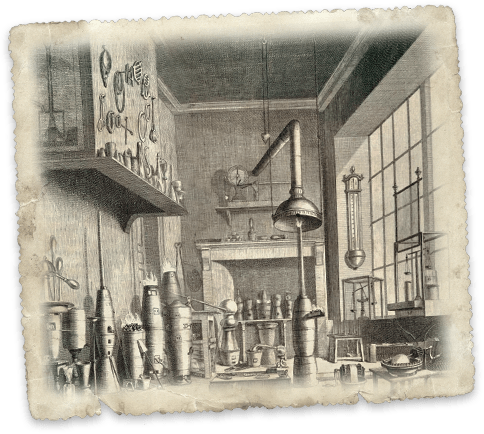 Mary Shelley is said to have come up with her idea from a bad dream about a scientist who didn’t like the results of his experiment. And now here we are, waking up with three of the “Big Five” publishers in the Department of Justice investigation — HarperCollins, Simon & Schuster, and Hachette — hustling right over to settle the antitrust lawsuit out of court. They admit to no wrongdoing, mind you (which is hardly unusual in settlements). Macmillan and Penguin have not settled, nor has Apple. For the basics, I’ll do is point you toward a couple of strong summations of the action, rather than crawling back through the nittier grit here. Laura Hazard Owen at paidContent has posted Everything you need to know about today’s e-book lawsuit in one post. And Julie Bosman put together, and has updated, Justice Dept. 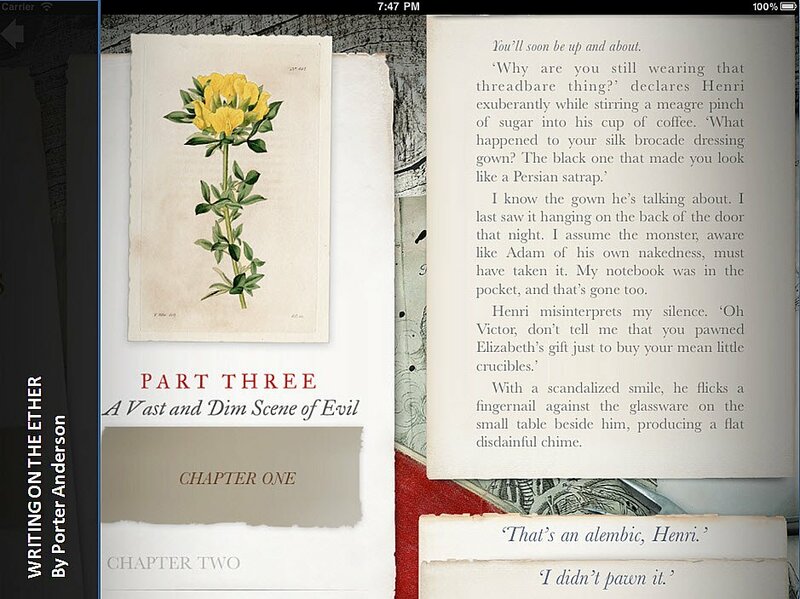 Sues Apple and Publishers Over E-Book Pricing; 3 Publishers Settle at the Times. A lot of this palaver was unnecessarily loose, sometimes irresponsible, probably none too impressive to anyone following from outside the industry. On reading the statement from Sargent, one angry observer tweeted that just because some publishers were settling, they weren’t necessarily guilty of the DoJ’s charges of collusion. But of course no one tweeted the converse: just because Macmillan and/or Penguin and/or Apple go to court fight the DoJ’s lawsuit?–doesn’t mean that one or all of them is innocent of the allegations, either. Unless you’re one of the chiefs of a company named in the suit, you don’t actually know. The Amazon-bashing was typically high. Actual readings of the DoJ’s brief — widely available online — seemed unfortunately low. And when Jeff John Roberts at paidContent wrote that 16 states had filed their own antitrust lawsuits — States pile on, claim Apple e-book conspiracy cost consumers $100 million — some took it as a signal to bemoan a “black day for publishing,” the industry cast as a victim. They might be forgiven based on Roberts’ headline, toned as it was with that phrase “states pile on” — something short of neutral, isn’t it? To be clear, I’m a consistent supporter of paidContent’s folks’ work. Since some of them at times report and at other times comment, I’d like them to make it clearer when they’re in which mode. Commentary is great, especially from people as astute as Roberts and his associates — just slug it as such, and do it faithfully. We believe that consumers paid millions of dollars more for some of the most popular titles. Hold onto that language about consumers. We’ll be back to it shortly. The attorney general thanked those piled-on states’ attorneys general and “our partners at the European Commission for their hard work and close cooperation.” Oh yeah. The EC is across this, too. The purpose of antitrust law isn’t necessarily to protect smaller companies from larger companies, or even to prevent monopolies per se — the purpose is to protect consumers from the impact of a monopoly or collusive behavior. A case against Amazon wouldn’t make any sense unless it could be shown that Amazon’s behavior was causing higher prices — but the reality is that the publishers are the ones whose behavior is leading to higher prices (the publishers who settled get two years of “modified” agency pricing). 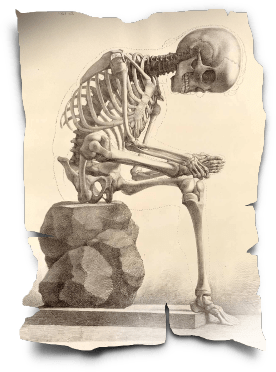 And by evening, Eastern time, a late-night posting in London came rustling across to us on Sam Missingham’s TheFutureBook’s blogs from journo Philip Jones. He’d kept tabs on the incremental progress of the news all day. In Fallen agents – how everything just changed, Jones not only comes to the desk with plenty of wit and experience, but he also has the blessing of that ocean’s distance from our pageant. Both companies are taking an enormous risk in seeing the DoJ in court. The evidence against them looks substantial, notwithstanding Makinson’s view that the DoJ filing “contains a number of material misstatements and omissions.” The costs will be huge, the implications if they lose enormous, and the potential for further reputational damage, even if they do pull off a win, clear. The bigger worry is that publishers have not just lost this battle, they will also now lose the peace. Even if collusion did not take place, the suggestion of it is now indelible. Publishers now need to focus on the next step: adjusting to a world where ebooks become the dominant format…where they have little control over whether their audience chooses to read in e or p, and where they cannot create barriers to ebook adoption by using price. I’m struggling to see any winners here, except of course Amazon, which has already said that it looks forward to extending discounts across more ebooks. Oh, and book readers who will enjoy cheap ebooks from a dwindling range of publishers and retailers. 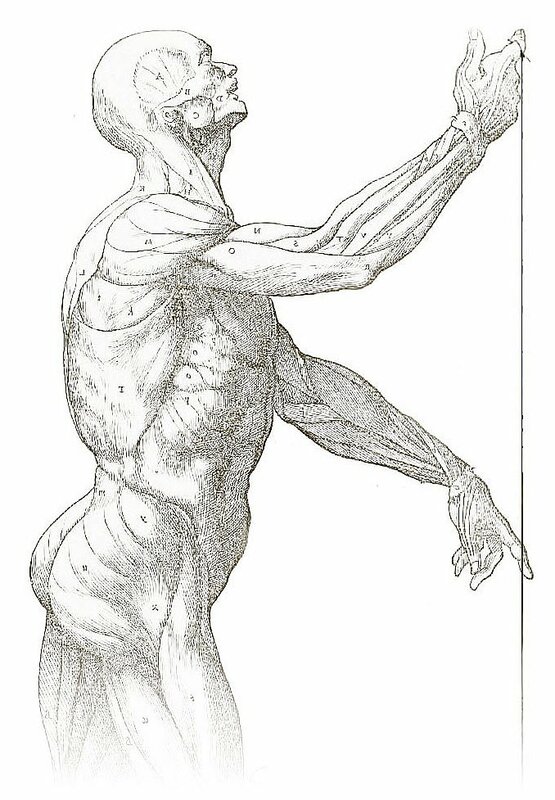 The key image for the Morris/inkle Frankenstein is a work of Vesalius from "De corporis humani fabrica libri septem." Frankenstein — from which our Ether-eal artwork is drawn this week — is a new adaptation of Mary Shelley’s 1818 classic. It’s written by London author Dave Morris and developed by him with the assistance of Jon Ingold, a former Sony Playstation designer, and his people at Cambridge’s inkle, a transmedia storytelling studio. Here, Morris tells me, Victor Frankenstein still is from Geneva, but rather than being at Bavaria’s Ingolstadt (where the Illuminati were established, incidentally), he’s at university in Paris. In 1792. Which would seem to be an inconvenient place and time for a DIY project about cobbling together a guy on a slab. But what do I know? — no shortage of anatomical raw material, one assumes. Frankenstein isn’t a game. It’s not about winning or losing or solving puzzles. It’s a literary experience where the reader can explore the text, creating a unique and personal experience of this rightly world-famous work. As the plot unfolds, you develop a personal relationship with the main characters. That’s why we’re describing it as interactive literature — it’s a truly new kind of novel for the digital age. Touted by Profile Books as “the first literary, interactive book app,” this Frankenstein goes on sale in two weeks, on April 26, for £2.99 (US$4.76) — only for iPads and iPhones. Your Android/Kindle money apparently has no allure for Profile Books, nothing seems planned for the huddled millions of us on tablets and phones beyond Apple’s reach. Special thanks to Profile’s PR folks for getting these images to me. And here’s a trailer, if you’d like to get the tone of the app, with some Beethoven (from the Fifth, the opening of the Allegro) handsomely efforted by the Fulda Symphonic Orchestra, Simon Schindler conducting. I’m able to identify the artists for you because the music is graciously credited on the video’s page, bravo.